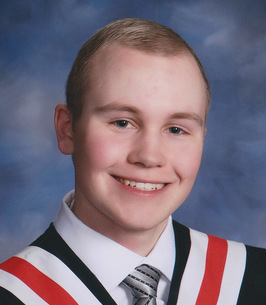 It is with deep sadness and with heavy hearts we announce the passing of Jordan Micheal Iszcenko, surrounded by loving family on October 22, 2018 at the age of 20 years. Jordan was a larger than life kid, and anyone who met him would agree. Jordan was loved by all and will be missed for his gentle nature, inspiring positive attitude and compassion for others. The void that his departure leaves in our hearts and lives is truly indescribable. It is only surpassed by the gratitude we have of being fully loved by him, and entrusted to have been given the gift of his life for the past 20 years. Jordan faced huge health challenges for 5 years with unwavering grace and courage. Despite these challenges, Jordan graduated from Victoria School of the Arts with honors and completed 2 years at NAIT in Digital Media Cinematography. Jordan had many interests and talents like film making, Ukrainian dancing, playing the saxophone and violin, skiing, baseball, soccer, and gaming on his PS4. Jordan loved all things Ukrainian, and was a strong, invaluable member of the Ukrainian community. He was a youth instructor and summer camp leader with the Ukrainian Youth Association and a member of the Dunai Ukrainian Dancers. He is survived by his supportive and devoted parents, Kevin and Sonia Iszcenko; look-alike younger sister, Roxy; his unconditionally loving grandparents, Anne Brytan (Baba B) and Toby and Margaret Iszcenko (Papa and Baba); as well as numerous aunts, uncles, cousins, and friends. He will be welcomed into heaven by Michael Brytan (Dido); Eugene Iszcenko (Godfather and Uncle); and Noella Ostash (Aunt). We wish to express our gratitude to Dr. Flanagan, Dr. Paul, Dr. Amigo, and the compassionate staff of the Stollery Children’s Hospital, Cross Cancer Institute, and Grey Nuns Palliative Care Unit. A Celebration of Jordan’s Life will be held on Sunday, October 28, 2018 at 6:30 p.m. at the Ukrainian Youth Unity Complex, 9615-153 Ave, Edmonton. Divine Liturgy Monday, October 29 at 10:00 a.m. at St. George Ukrainian Catholic Church, 11305-95A Street. Reverend Stanislav Bjeli officiating with interment in St. Michaels Cemetery. In lieu of flowers, Jordan requested donations be made to the Edmonton Humane Society or to Verkhovyna Ukrainian Song and Dance Ensemble. We encourage you to share any memorable photos or stories about Jordan Micheal. All tributes placed on and purchased through this memorial website will remain on in perpetuity for future generations. Jordan was such a beautiful soul with so much joy and talent to give to this world. It was an honour to know him and watch him enjoy the life he had to the fullest extent. My thoughts and prayers to Kevin, Sonia and Roxy. He will always be with us all in our hearts. Sincere and deepest condolences to your family on your loss. Our thoughts and prayers are with you during this most difficult time. Вічная память Йорданові. Our heartfelt condolences. Words cannot ease the pain, but know we are thinking of your family at this difficult time. “Wherever a beautiful soul has been, there is a trail of beautiful memories”. Jordan always brought gales of laughter to our Band classes at Vic. A truly talented guy, he was also warm-hearted and never failed to help a fellow alto sax player in need :) What an incredible life he lived; he accomplished so much in the short time he was given. I'm so saddened to hear of his passing and send my sincere condolences to his family. It was an honour to know you Jordan. Your passion for doing the things that you loved and your kindness towards others was inspiring and will never be forgotten. Jordan was an amazing human being and the best person I have ever had the good fortune to call my friend. Jordan will be dearly missed and always remembered. I am so sorry for your loss. If there's ever anything I can do, I'm always willing to help.